The Transfer to Online Commerce, Ten Critical Performance Goals. B2B e-commerce is set to grow 45%, eclipsing $1.1 trillion by 2020 and is simply too big a deal to ignore. The annual market in the United States for ink and toner is $25 billion and, although declining at a modest 1% or so per year, is primed for change. The final piece of the puzzle necessary before significant change can take place is from within the community of independent resellers. However, for this group to fulfill their role, it's necessary for many (most) of them to undergo business transformations addressing ten critical deficiencies. For those that successfully accomplish this, there's an opportunity to participate in the transfer of commerce (from offline to online), that's already irreversible. A 200-unit case study of independent resellers current capabilities in the ten capability segments shown in the infographic, resulted in an average score of 25 on a scale of 100. Focusing on addressing the deficiencies can lead to quick wins and a projected improvement to 82 within 12 months and 90+ within 2-4 years. Look at the seven, key performance indicators below necessary for a quantifiable measurement of a successful business transformation. Our case study involved over 200 reseller businesses and the result, in terms of current scores for each of these components, is shown in the graphic. 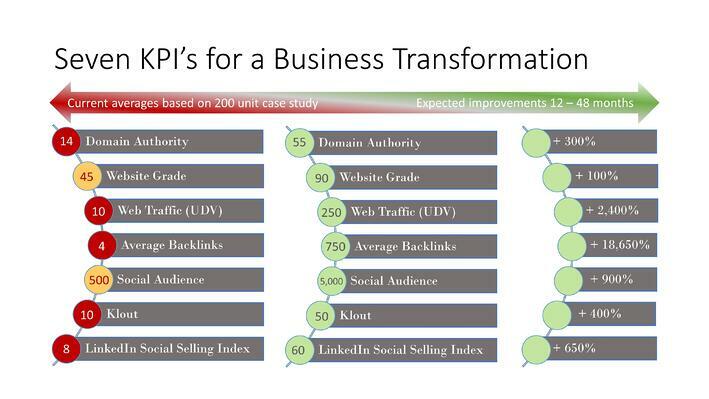 It's simple, unless a reseller focuses on each of these components, putting a program in place to make improvements and accomplish performance goals of the scale shown, then that business will fail to participate in the opportunity presented during the transfer of commerce from offline to online. If you'd like to learn more about a unique Digital Transformation Service - everything you need for a digital upgrade and the tools needed for developing new business with Blue Ocean caliber customers, then click on the link below. If you missed my eight-part series on the aftermarket tipping point, please check out my FREE new eBook, just published and a thorough examination of the office supplies industry and a path to the $20 billion growth opportunity.